TURBO YEAST ALCOPURE. Add Alcopure yeast. Dissolve s ugar in 21 Liter (5,6 Gallon US) in warm water (look at table). 7 kg (15,5 lbs) 72 h 17% 26 - 30°C (78,8 - 86°F). 6 kg (13,5 lbs) 48 h 15% 26 - 30°C (78,8 - 86°F). Main Material:Glass. : 12mm/0.47”. : 7mm/0.27”. We will response in 24 hours to resolve the problems. Turbo yeast Gozdawa Polish Moonshine Big Batch for 130L/34.7 Gal. Add Gozdawa Polish Moonshine turbo yeast. 450g (15.87 oz.). Active Yeast. High alcohol formula. Dissolve 33kg (73 lbs) sugar in 110L (29 Gal) lukewarm water (temperature about 26-27 ° C /78,8-80,6 ° F/ ). Pouring wine, bottling, etc., very easy to use. To prevent clogging the silicone tube, Filter the pomace move into the silicone tube. We will do our best to help you to resolve your problems. We would try our best to help you solving any problem. (Specialized for "Shoyu", "Soy sauce". Maker : Hishi-roku, Kyoto Japan. Qty NET : 20g. We are going to introduce various products from Japan. It's depending on your country's circumstance.). Make sure your keg is always kept cold. If your keg warms up you will have foaming issues. Insert into the bottle in the off position, the valve is then turned to CO2 to flush the bottle and then to beer for filling. Sugar: 0-32%(Only for Brix). The proportion of wort: 0.002 mm. Wort proportion: 0.001. The scale is clear with the imported lens. Let the solution cover the whole prism surface. We'd like to settle any problem in a friendly manner. Input Power: 100 ~240VAC, 50Hz/60Hz. 10A, 100V ~240V AC. Temperature Resolution: 0.1 ° C / 0.1° F Temperature Accuracy: ±1°C (-50 ~ 70°C) / ±1°F (-50 ~ 160° F). Maximum output load: 1000W(110V)/2000W(220V);. We use it to fit the top of a Turbo 500 Boiler and they are a perfect fit. 2 One sided silicone gasket. 1 SS304 DN 40 nut. This is a DIY kit. 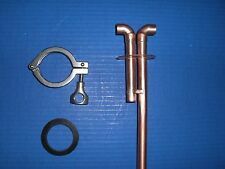 You get all the parts and simply solder it together yourself and save money. 3/4" main tube and 1/2" inlet tube. Not use adapter. Due to light and screen setting difference, item's color may be slightly different from the pictures. Thread: TR 21 4. USA, Canada, United Kingdom, Austrilia, France, Germany, Spain, Ireland, Italy, Others. SPP Spiral Prismatic Packing ONE LITER + STOPPERS ! DISCOUNT ! To do that, one is to multiply the cross sectional area value calculatedincm2. It decides on heating powers on which the distillation column should work. Springs should be covered with a specially prepared substrate. This adjustable pressure valve with gauge allows you to relieve pressure while filtering your beer from one keg to another. 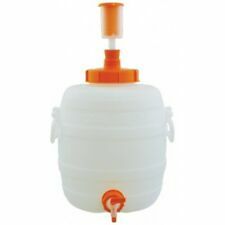 Great for household beer brewing. 1 x Adjustable Pressure Valve with Gauge（without ball lock connect）. These are root sections that you plant to start your own hop plants. Defined by its citrus, and often more specifically grapefruit flavor, it is now sought out around the World. Used in so many craft brewed pale ales, but none more famous than Sierra Nevada's Pale Ale. Complete set.Fits Ball Lock kegs only. 1 x Lid gasket. 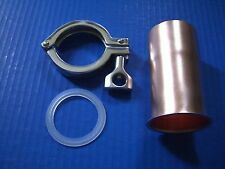 2 x Dip tube seals. 2 x Plug seals. Due to the difference between different monitors, the picture may not reflect the actual color of the item. Due to light and screen setting difference, the color of item may be slightly different from pictures. USA, Canada, United Kingdom, Austrilia, France, Germany, Spain, Ireland, Italy, Others. Canada, United Kingdom, Austrilia, France, Germany, Spain, Ireland, Italy, Others. For 100L (26.4 Gallon). Add Gozdawa Polish Pure Vodka turbo yeast. 25 kg (55.12 lb.). sugar in warm warter dissolve, add up to 100l (26,4 Gallon) water (temperature about 26-27 ° C /78,8-80,6 ° F/ ). Active Yeast. Mainly used for beer,also boiled juice added dough and baked bread. Strong hop flavor that balances the natural sweetness of the wort and stimulate appetite. It is conducive wort clarification. Uses: used for make wine. Wine Beer Brewing Bottle Dryer/Drying/Draining/Drainer Rack,Handle, Base PICK. 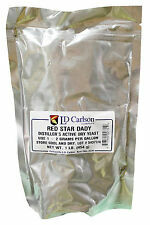 Red Star Distiller's Yeast (DADY), 2lb. Bulk two packets. Home-brewing and wine-making are rewarding and interesting hobbies. When you make your beers and wines, you will have total control over the ingredients, flavor, and intensity of each beverage. There is an array of equipment and supplies that you can make use of when crafting your own fine drinks and beverages. What supplies should a home brewer purchase? Boiling pot: The extracts, hops, and other ingredients go into the boiling pot to produce the final product. Most brewers will find success with a 1-gallon or 1.5-gallon pot. Stirring spoon: A long spoon capable of reaching the bottom of the pot is necessary for home brewing. Both plastic and stainless steel spoons are good choices. Strainer: When moving the wort from the boil kettle to the fermenter, running the liquid through a strainer results in a smoother brew. Plastic bucket: The wort must be stored as it ferments. Many beer equipment kits feature plastic buckets as an easy-to-use option. What kind of equipment is needed for home wine-making? Fruit press: A press is used to extract juice from grapes and other fruits during winemaking. Multiple styles are available, but each exerts pressure on the fruit to free the juice. Nylon straining bag: These bags prevent excess sediment from entering your wine. Nylon bags can also be used for brewing in lieu of a metal or plastic strainer. Corks and a corker: If youll be using traditional wine bottles, be sure to have several corks on hand. A tool called a corker is used to securely close each bottle. Racking cane: This hard plastic tube is used to move wine from one container to another when bottling. What ingredients are used for home-brewing and wine-making? Creating your brews involves several components. Brewers need a starch source, such as barley, that can be converted into sugar and then fermented with brewers yeast. 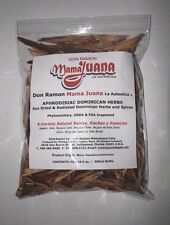 Flavorings, including hops, herbs, and spices, add dimension to the beer. Grapes are the primary ingredient when it comes to winemaking, but there are other substances used to create unique pours. Sugar, potassium sorbate, water, and powdered tannins are all used in winemaking. Why is bottle sterilization important? Sanitizing your beverage bottles ensures that each vessel is clean and ready to be filled with your favourite beverage. Carboy brushes and liquid cleansers are both examples of sterilizing tools. What bottles can you use for beer and wine? Beverage bottles are available in several shapes, colours, and sizes. The type of beverage served may influence the choice of bottles. For example, champagne is stored in a dark wine bottle to protect its consistency. However, brews without hops can be served in clear bottles.